Ivelisse Pabon de Landron is passionate about many things in her Puerto Rican heritage. 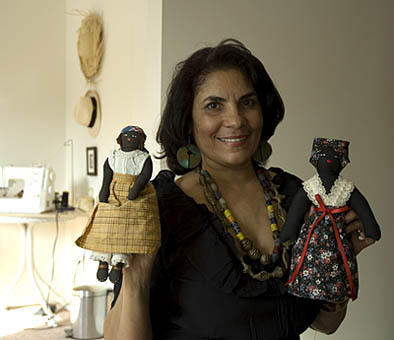 Having first learned doll making from her mother, Ivelisse went on to do extensive research on the Puerto Rican black doll, and eventually met with older doll makers in Puerto Rico. Born in New York, Pabon de Landron grew up in the barrio of the Lower East Side, where her mother was a community organizer. Both of her parents were from Puerto Rico; her father was descended from a line of Africans brought to the island in 1834 to work the sugar plantations, and her mother came from Spanish and Taino heritage. For much of the past decade Pabon de Landron lived in Puerto Rico where, she says, "I wanted to know about my heritage. I wanted to understand the culture, because my dad was black and my mom was white and I wanted to know where that came from. . . .I wanted to know why the culture was the way it was - the music, the food, the dancing. " While living on the island, Ivelisse met and learned from many older doll makers. She sees carrying on the tradition as a way to honor the ancestors, especially Puerto Rican women of African descent and their contribution to cultural history, such as women's roles as slaves on sugar plantation, as la comadronas (midwives), and as la jibara (country peasants). She eventually marketed her dolls at the Plaza in Old San Juan. Since returning to Massachusetts in 2008, she had made dolls, conducted doll-making workshops, and created Soy Negra Productions to lead a number of community-building and heritage workshops. Of her work doing ancestral research and creating stories for her dolls, Pabon de Landron says, "I honor the past in Puerto Rico and the immigrant life in the US." In 2010, Ivelisse Pabon de Landron was named an MCC Finalist in the Traditional Arts.